Bake the sweet potatoes at 180 degrees Celsius for 45 minutes, or until completely cooked through. Meanwhile, boil the quinoa for 10-15 minutes until done, then drain. Finely chop the parsley and the mint leaves and mix with the quinoa. Halve the cherry tomatoes, finely dice the red onion and add these to the quinoa mixture. Add in the lemon juice, balsamic vinegar and olive oil and mix so that everything is evenly distributed. Top the sweet potatoes with the quinoa mixture, some tomato sauce, black beans, vegan mayonnaise and the cress. Serve immediately! 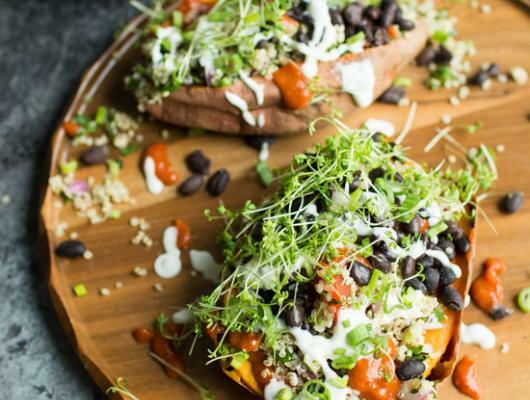 Loaded Sweet Potatoes with Quinoa Tabbouleh. 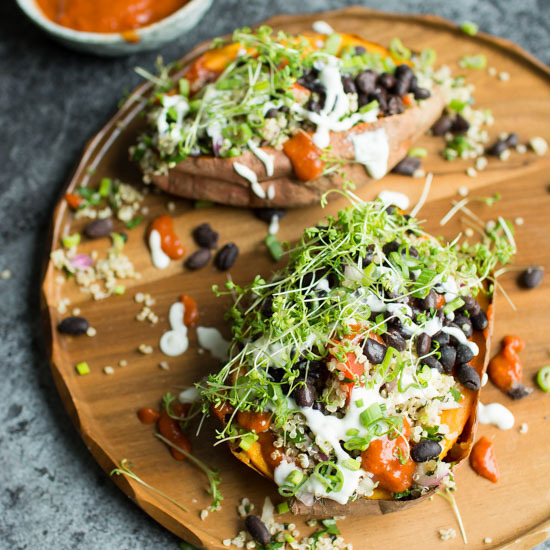 Healthy and totally vegan, these baked sweet potatoes are topped with fresh, vibrant ingredients for a great, satisfying meal!